What is the difference between a precious stone, a semi-precious stone, and a gemstone? A gemstone is a precious or a semi-precious stone used in jewelry. Gemologists identify gemstones. They label gems in the arena of gemology using practical language and their features. A gemologist uses the gemstone’s chemical arrangement to classify it. For instance, diamonds are made of carbon (C). Many gems are categorized by a crystal system because they are crystals. Gemstones are classified into different varieties, species, and groups. They are also characterized in terms of dispersion, hardness, specific gravity, refractive index, luster, fracture, and cleavage. Flaws in a stone are known as inclusions. A precious stone and a semi-precious stone are both classifications of gemstones. It is a portion of a mineral, which, in refined and cut form, is used to create jewelry or other embellishments. The term “precious stone” versus “semi-precious stone” is a commercial term that simply isn’t always applicable.They are terms that exist solely in the West and were created as a marketing tool by the people who were looking to sell precious stones. Precious stones are diamonds, rubies, emeralds and sapphires. All other stones are considered semi-precious stones. Amethyst is the birthstone for February and is a vibrant violet purple color. Amethyst belongs to the quartz group of minerals and is very valuable and precious. Amethyst receives its purple color from aluminum and iron impurities. Amethyst has many powers but especially to soothe and stimulate emotions and the mind. It allows the logic of sobriety and restraint but conveys the energy of passion and fire, spirituality and resourcefulness. 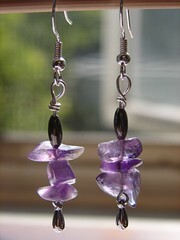 See our photo gallery of amethyst jewelry. Citrine is a very popular gemstone that comes from a large family of quartz gemstones. “Citrine” derives from the French word, “Citron,” which means “lemon,” even though citrine is more golden than a lemon color. Citrine carries the power of the sun. It is heartening and warm, life giving and invigorating. The crystal itself has many key energies. It brings the influence of citrine to your exertions. Citrine is a premier stone of resourcefulness, personal will and manifestation. 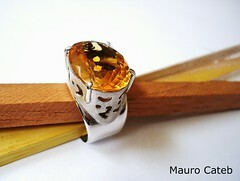 See our photo gallery of citrine jewelry. As one of the earliest stones mined, turquoise was used an an amulet for protection and symbolized wealth in ancient cultures. 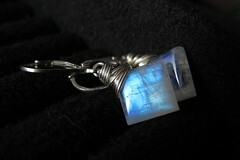 As an amulet, it was believed to protect from harm and negative energy. It is a symbol of friendship. Blue topaz was discovered over two thousand years ago. The Egyptians were the first to use the gemstone. It contains hydroxyl and fluorine which make it an aluminum silicate. It is colorless in its purest form. Blue topaz is used when you want to seek forgiveness, develop perseverance, or reconcile differences. It is also used excellently for healing efforts from destructive behavior and addictions. It also helps to bring cheerfulness and trust. 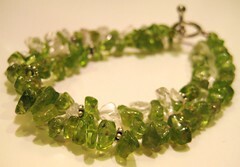 Peridot is only found in one color which is a vibrant green color and that is rare for most gemstones. 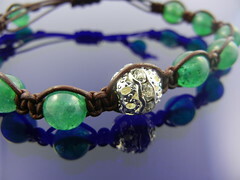 It is a part of the olivine group, which is part of the forsterite-fayalite mineral series. Peridot derives from the Arabic word, “faridat” which means gem. Today it can found in the United States, Asia, and the Middle East as well. Jade is known to convey affluence and money, captivate affection and helps with self-healing. It also offers security from adversity and calamities. 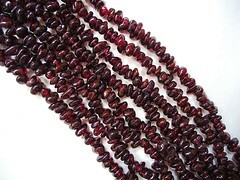 See our photo gallery of garnet jewelry. Tourmaline originates from the term, “turamali” in Singhalese which means, “stone of mixed colors.” It has a very exclusive spectrum of colors and stands alone by that fact in the world of gemstones. Tourmaline is a very adaptable gemstone and is available from the color black to being entirely colorless. 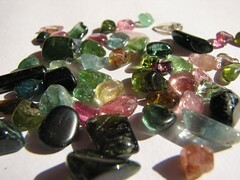 Tourmaline is used in exertions to secure a sound monetary future. It also is used to develop physical strength. 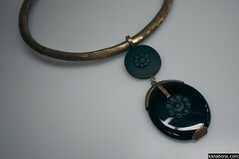 See our photo gallery of tourmaline jewelry. Malachite has distinguishing green veining and it is a copper carbonate. It’s a not a particularly hard stone and is typically found near copper ore deposits. 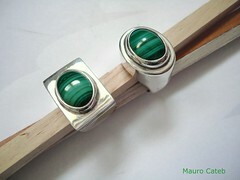 Most famously, malachite is found in mines in Russia in the mountains. However, today production takes place in the Congo (formerly Zaire). Today, also it is far scarcer than it has ever been in decades previously. Malachite is an authoritative stone of protection from physical damage and is a great way to join with Mother Earth through meditation. It is known for acts of assistance and service to others. The term jasper derives from the Greek word for, “spotted stone.” Scientist put jasper in a group all by itself due to its grainy structure but it is usually considered to be chalcedony. It contains foreign materials that make up its streak, color and appearance and account for 20% of the stone itself. The rarest type of jasper is uniform. 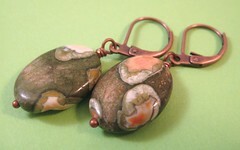 Jasper is essentially the gemstone of vivacity, security, and physical energy. It is good to keep in your home, work, or car for extra protection. Tanzanite is well known for its worldwide success and has continued to be in demand since its discovery in 1967 in Tanzania. There are technically three different colors on the spectrum and they range from green to purple to blue. Deep blue is the most coveted color which typically has a purple hue shimmer to it. It is trichroic and displays distinct pleochroism. Tanzanite is a significant communication stone, giving a person the capability to express the truth. It also increases awareness in meditation, endorses consideration, enlightening a person so they understand their own heart, and also soothes an overcharged mind. 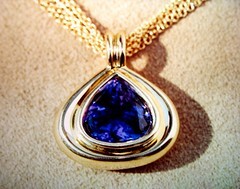 See our photo gallery of tanzanite jewelry. Opal derives from places such as Mexico, Brazil, Australia and the United States. The cost of opal depends on the nature and occurrence of color flashes. Each opal is markedly separable more than any other gemstone. The most elusive gems universally worn are opals. Opals require distinct care to keep them healthy and wearable. Opal is a gemstone of legend and wisdom. It is known as a healing stone and is associated specifically with the eyes. It is the birthstone for October. Opal has a calming energy and vivid colors. 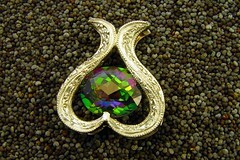 See our photo gallery of opal jewelry. 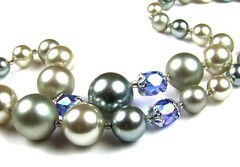 Pearls are created by the coinciding of the platelets of film and aragonite of conchiolin flanking to the pearl surface. They are the products of bivalve mollusks (which is mostly mussels and oysters). Pearls are not specifically hard, but they are spectacularly difficult to crush and compact. Pearls are products of bivalve mollusks (mainly oysters and mussels). The pearl’s color varies greatly by the water and type of mollusk. Pearl is the representation of virtuousness and pureness. It is more often than not worn by brides and sown into their gowns for their special day. It is the birthstone for June and there are a great deal of traditions and customs associated with the gemstone. See our photo gallery of pearl jewelry. Onyx occurs naturally in groups of white and black, but also is usually dyed to get the accustomed jet black color that people expect. It is a cryptocrystalline type of quartz and is chalcedony, the black form. Black onyx is a stone for improving self-control, expelling heartache and intelligent decision making. It is meant to quiet apprehension and encapsulates too much energy as well. Aquamarine is in the same family as beryl or emerald and is most well-known for its incredible range of beautiful blue colors. The name means seawater in Latin and that’s where it derives from. 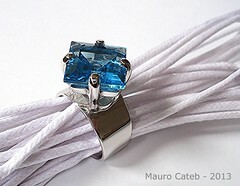 Dark blue is the most desirable color for aquamarine. It is a very hard gemstone as well. Aquamarine seems to be only growing in popularity and is a more moderately priced stone. It is also the birthstone for March. Aquamarine was used traditionally to purify water by the Romans. It is a conventionally soothing stone. It helps to keep your breathing tranquil and secure during stressful times. See our photo gallery of aquamarine jewelry. There are wide arrays of colors that topaz comes in. They are orange, red, yellow, brown, clear, pink, and blue. Blue topaz with a medium hue is the most shared version of the gemstone and it can be found in huge sizes at inexpensive prices. It has a high refractive index and a very high hardness. The rarest form of it is moderately scarce and is called Imperial Topaz. Topaz surges your mindfulness of actions and judgments and their karmic properties. It cleanses engagements as well as feelings. It starts cosmic consciousness and eliminates motionless energy as well. It is a sympathetic and comforting stone.